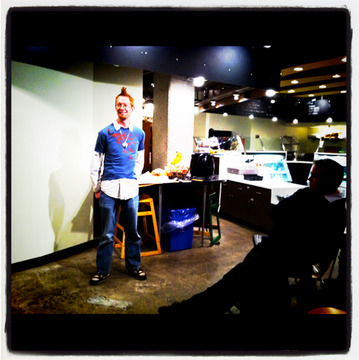 Last night was the first ever Quantified Self Toronto meetup. I presented on my new "Heart Flasher" project of monitoring my heart-beat, flashing it with LEDs to those around me, and logging it. Others presented on everything from posting a photo everyday for family and friends to see to trying to solve night cramps, to living your life inside emacs (her notes of this events are epic, but of course do not include her own talk!). I perhaps need to change the logo of this site to her little drawing of me, it's super cute! And of course Alex talked about her wonderful CureTogether website. I met several really cool people and overall the event was a smashing success, we're going to do it again soon!